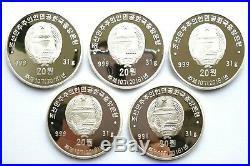 LOW mintage limit, only 2,000!! Certificate of Authenticity+Presentation Case. Coin with Swarovsky Element insert. 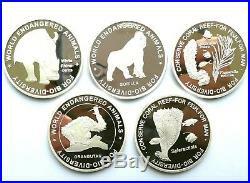 10th coin from Endangered Animal Series. 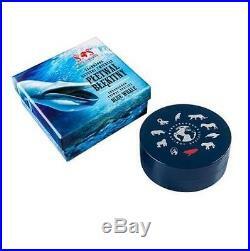 The Mint of Poland is proud to present the last, 10th coin from the series Endangered Animal Species, devoted to the Blue whale the biggest mammal of all times. The coin shows the exceptionality of the Blue whale with its vivid decorations. 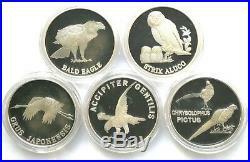 First of all, colorful animals depicted on the coin are extremely lifelike. This unique silver token is also embellished with SWAROVSKI ELEMENTS, which imitates a magnifying glass (showing the regional distribution of the species). 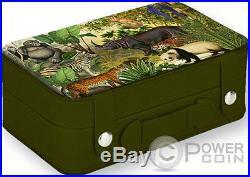 Besides, the coin is accompanied by an original presentation case, pleasantly decorated with the images of Blue whales. This unique coin reminds us how fragile is the beauty of animals being on the verge of extinction. Blue whales were almost hunted to extinction by whalers attracted by their enormous size. These impressive marine mammals have been classified as critically endangered, and thanks to this decision their population is now slowly recovering. In the central part of the coin multi-colored images of Blue whales in their natural environment. Above, right-hand contour of a map showing regional distribution of the species. Along the rim inscriptions: ENDANGERED ANIMAL SPECIES (name of the series), BLUE WHALE (name of the coin). In the central part of the coin effigy of Her Majesty Queen Elizabeth II. Below inscriptions: Ag 999 (hallmark), m/w (mint mark). 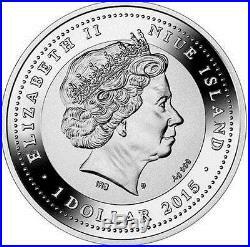 Along the rim inscriptions: ELIZABETH II, NIUE ISLAND (issuer), 1 DOLLAR (face value), 2015 (year of issue). Nice Authentic add to your collection. We are established and guarantee the authenticity of the products we sell. We have our inventory of precious metals bought only from reputable mints. Please consider your fair Feedback. Let us know if you need this overnight. We will do our best to accommodate your request. Fast shiiping will take 3-4 days(extra charge). For damaged items, please save all outside and inside packaging and wrapping for inspection by the Post Office. Return item must be sent within 14 days after it has been received. We will do our best to satisfy our customers. Fell free to contact if you have any questions. Track Page Views With. Auctiva’s FREE Counter. 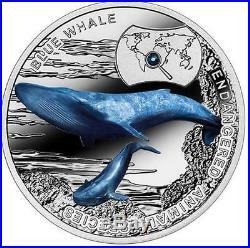 The item “Niue 2015 1$ Endangered Animal SOS to World Blue Whale Silver Coin” is in sale since Thursday, February 19, 2015. 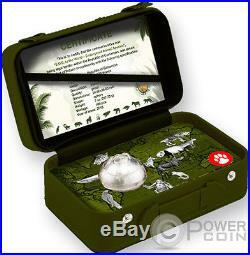 This item is in the category “Coins & Paper Money\Coins\ World\Australia & Oceania\South Pacific”. The seller is “worldancient” and is located in Etobicoke, Ontario. This item can be shipped worldwide. 217.7 (7 oz). 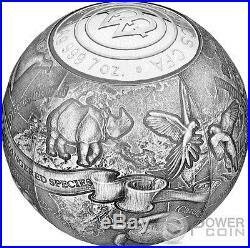 ENDANGERED ANIMALS SOS To The World Spherical 7 Oz Silver Coin 5000 Francs Cameroon 2017. This amazing 7 Oz Silver coin is dedicated to some of the most Endangered Animal species of our planet, with the aim to raise public awareness. The coin has a beautiful Spherical shape, has an incredible design, has a Proof quality and comes in a special case, along with the Certificate of Authenticity. Limited mintage to only 499 pieces worldwide! The shape of the coin represents our planet and shows some beautiful animal species over their native land. 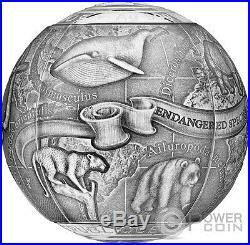 The design presents the name of each animal and on the centre of the Sphere, the inscription: ENDANGERED SPECIES. On top of the Sphere, the Mint of Poland mark and the inscriptions: Ag 999 7oz. The weight of the coin and the fineness of the Silver and 5000 FRANCS CFA the face value. On the bottom of the Sphere, the inscriptions: REPUBLIQUE DU CAMEROUN the issue country. Endangered Species An endangered species is a species which has been categorized as likely to become extinct. Endangered (EN), as categorized by the International Union for Conservation of Nature (IUCN) Red List, is the second most severe conservation status for wild populations in the IUCN’s schema after Critically Endangered (CR). In 2012, the IUCN Red List featured 3079 animal and 2655 plant species as endangered (EN) worldwide. The figures for 1998 were, respectively, 1102 and 1197. Many nations have laws that protect conservation-reliant species: for example, forbidding hunting, restricting land development or creating preserves. Population numbers, trends and species’ conservation status can be found in the lists of organisms by population. 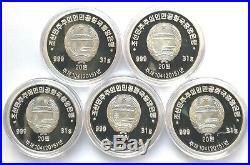 The item “ENDANGERED ANIMALS SOS To The World 7 Oz Silver Coin 5000 Francs Cameroon 2017″ is in sale since Monday, June 05, 2017. This item is in the category “Coins & Paper Money\Coins\ World\Africa\Other African Coins”. The seller is “powercoin_italy” and is located in Roma. This item can be shipped worldwide.